Please tell me you know where the quote on this pillow comes from? Surely, you know. Right? ANNE OF GREEN GABLES. Can we just have a moment of silence to reflect on the greatness of Anne Shirley. I was absolutely obsessed with that movie growing up. In fact, I still watch it at least a few times every year. There’s just nothing better. Anne and Gilbert forever! This gorgeous pillow is from one of my favorite Etsy shops of all time, With Lavender and Grace. You guys know I adore vintage grainsack style pillows, and this one couldn’t be more perfect for fall. I looooooove it and I’m sure you will see it in many of my photos coming up this fall. Now if you’ve been around for a while you know I always say that pillows are seriously one of the easiest ways to transition your home to a new season. Really, they’re just quick and effortless. 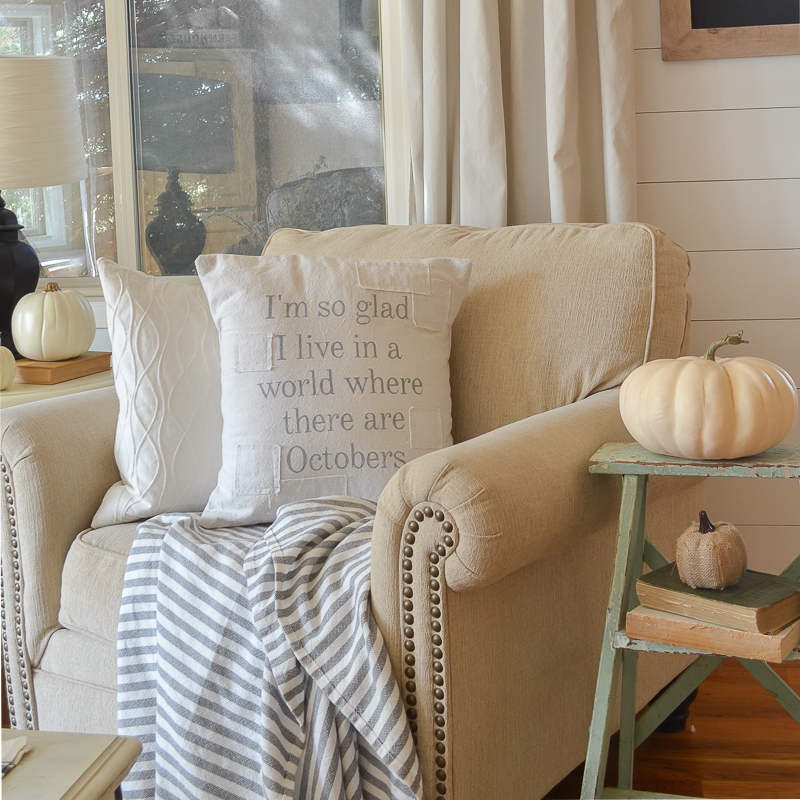 But finding seasonal farmhouse style pillows is a bit tricky. Have you guys noticed that? Most seasonal pillows at box stores are bright and flashy. So I’ve found that the best place to find pillows is on Esty. Yep, Etsy is full of ammmmmmazing pillows that are perfectly farmhouse. 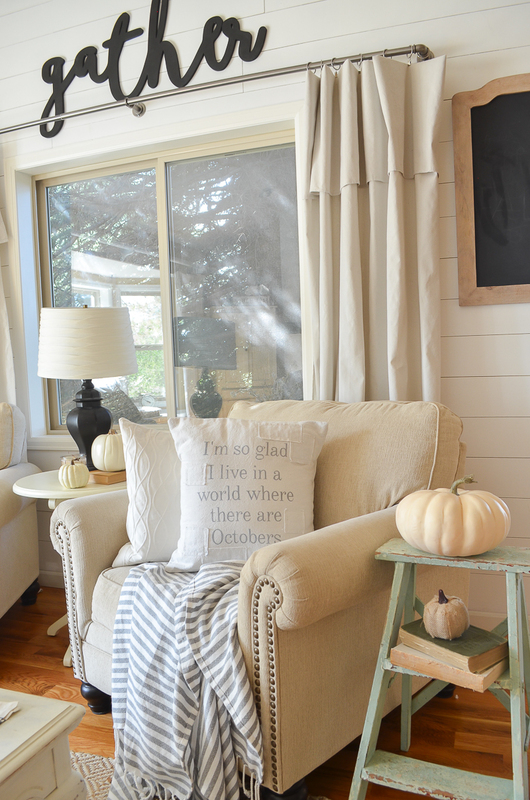 Here’s a great collection of my favorite farmhouse style pillows for fall! 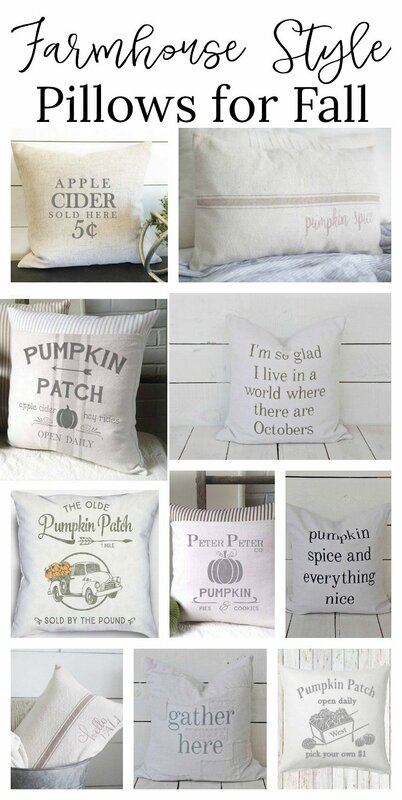 These pillows are so gorgeous and I just love how they’re all perfect for fall, but not over the top. 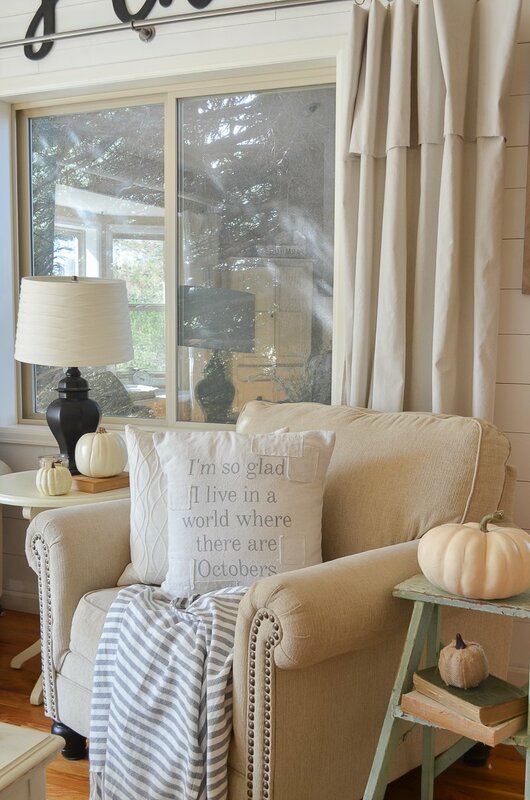 And did anyone notice those awesome pumpkin pillows with ticking fabric? I’m obsessed! Well I hope one of these pillows strikes your fancy and gets you in the mood to decorate for fall. It will be here before we know it! Thanks so much for dropping by the blog today. I hope you all have a fabulous weekend! Where is the best place to buy good quality pillow forms? Hi Velda, I buy mine from Amazon or Target! IKEA and H&M have awesome, down pillow forms for really affordable prices! 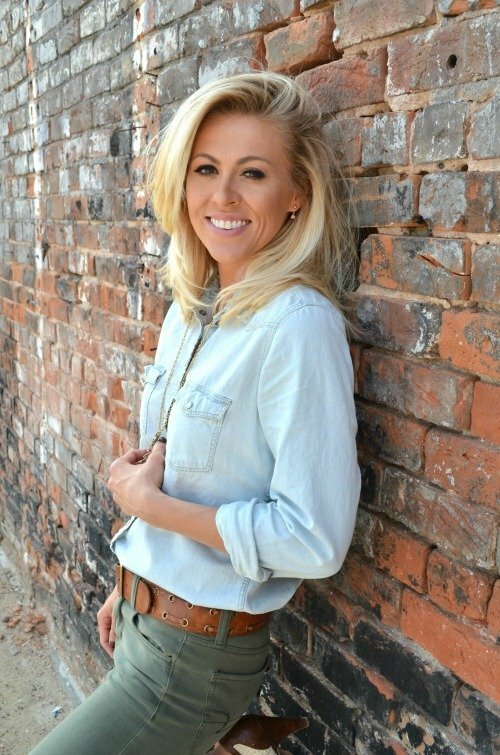 I absolutely love everything about your blog! I look forward to getting the new e-mails and can’t wait to see what they are!!!! Cute Fall pillow case. What do you fill your pillow with? It doesn’t look like it’s just the normal pillow filler. It looks more “cushy” lol. Best way for me to describe it. Also what movie are you speaking of where the saying comes from? I’m glad I live in a world that has Octobers. Thanks for the information and the inspiration. Is there a place we can share our projects with you and your followers? Hi Kelley! First, thank you so much for your sweet words. I’m SO glad you enjoy my blog! Secondly, I usually get my pillow inserts at Target or on Amazon. Or you can even buy them from here: https://rstyle.me/n/crqguwb6hgf And lastly, that quote is from Anne of Green Gables. One of the best movies/books EVER!! 🙂 And you can always share you photos with me through email or even on my Facebook page, I would LOVE that. https://www.facebook.com/littlevintagenest/ Happy weekend my friend. I LOVE Anne of Green Gables! I read the book and watched the movies all the time growing up too! And your pillow roundup is awesome! High five girl! I love Anne of Green Gables so much. I might need to watch it this weekend! Still love that little ladder! Me too! Time to bring it out again for fall. Yippeeeee! I know you’ve probably answered this numerous times, so I apologize for asking again, but where did you find a “gather” sign that large? Also, is it wood painted black, or is it metal? That is a great question Vicki, I should have linked it! That is from Feather and Birch on Etsy. It’s actually wood. You can find it here: https://rstyle.me/n/crqgptb6hgf Happy Friday! Love all of those pillows though! Hope your kiddos are feeling better…Have a great weekend! Love all of the pillows! Yes, we love October too! Although October isn’t a cheap month for us! My youngest son, daughter, one of our grandsons, my husband and myself have October birthdays! Enjoy decorating for fall! Maybe I should order the October pillow?! oh wow, your October is super busy Susan! You definitely need that pillow! I’m completely resisting fall, buuuut……I’m a huge Anne fan, so your pillow is weakening my resistance! 😉 Love the blog! ha!! I hear you Shawna! I’ve started adding a bit here and there because you have to grab that energy when you can! I’ve been weeding out tons of stuff in my fall bins, almost bigger than my Christmas bins!!! I couldn’t help but add a few things here and there and tuck some others in a cabinet for later!! Netflix has a Anne of Green Gables miniseries. “Anne with an E” Its a darker version and definitely not as good as the original movie or book but still interesting for real AGG fans! Love Fall and it never too early for me! I need to check that out! Thanks Soraya! Do you wholesale your images for the pillows on Etsy? Hi Janet! I haven’t done that, what are you interested in?